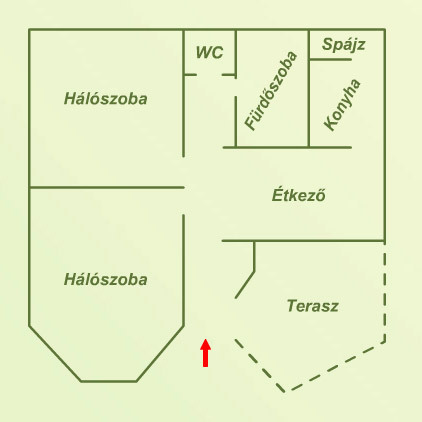 Our small, 1-storey house is situated in the center of the town in a small 150 m2 garden with grilling facility and garage. The house was built in 1992 and renovated in 2006 and it is ideal for a family of 4-5 people who like to be seaparated. Apartment: 39 m2 + 12 m2 terrace: Two rooms with two beds in each, an extra bed can be put into the larger room. Sat-tv in the lounge and in one room (optional), fully equipped kitchen, bathroom with bath tub and a separate toilet. The terrace opens from the lounge. Air-condition: optional. Heating: combination of floor and radiator heating.